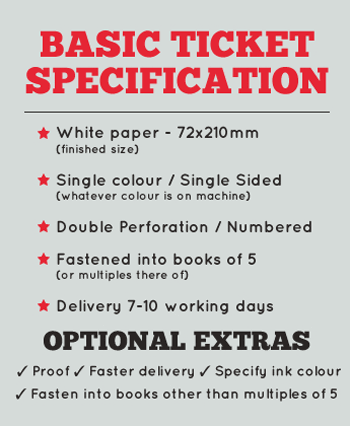 Colours are a digital representation only and may vary on printed ticket. It is essential that information entered into the fields is how you wish to see it printed on your ticket, ie correct spelling, correct grammar and capital letters where appropriate. WE WILL COPY and PASTE YOUR DATA ONTO THE FINISHED ARTWORK. Please use the SPECIAL INSTRUCTIONS box to advise any data not covered within the fields provided. Enter your organisation’s charity number, if applicable. Please limit prizes to a maximum of 4, Using a new line for each prize. See Help guide for guidance. Please limit prizes to a maximum of 4 and add “Plus many other prizes or Various other prizes“. Each prize should be started on a new line, particularly important where they are not listed as 1st, 2nd or 3rd. Adding the venue is optional but please complete as follows if required - Enter, eg. Blackpool Primary School Summer Fayre. By law an address where the promoter can be contacted must appear on the ticket. 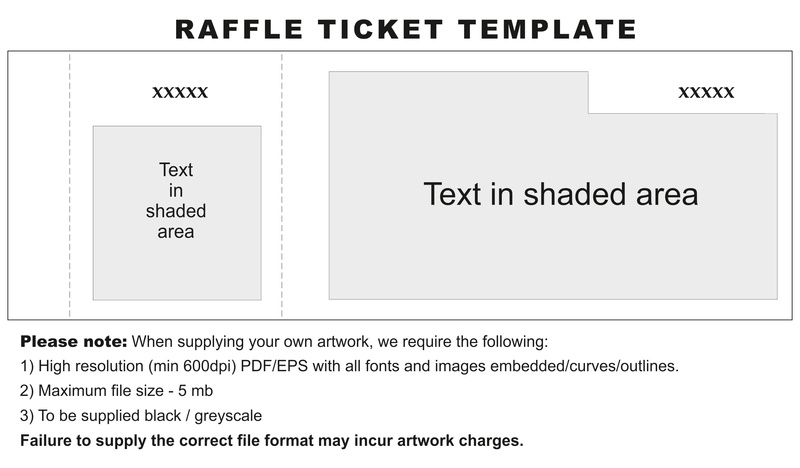 Does your raffle conform to the Gambling act 2005? As a general rule of thumb, a Private Draw applies when tickets are not on sale to the general public and do NOT need a licence. In this instance, tickets can only be sold to members of a particular group eg a Club or Workforce and can only be sold and drawn on the same day, at the same event that they were sold. If this scenario applies, please enter the name of your group to whom the sale of tickets is restricted to in the field below. Who are the sale of tickets restricted to? e.g. minor variations, additional counterfoil information. Need to make some changes? Go back a step using the "step 2" button above. Scroll up to ticket preview and double check ticket information. Need to amend Preview? Go back a step using the “step 3 “ button above. Please tick box below to confirm the TICKET PREVIEW is correct. I understand that a re-print resulted from errors i have approved will be charged as a NEW JOB. From the layouts below, please select your preferred option, giving careful consideration to the amount of text and if a logo is to be added. Please submit all changes in the box provided, including when the ticket you are amending was last printed, and if possible upload a copy. A proof of the new artwork will be emailed for approval. If PROOF is selected. delivery is calculated from date of approval dependant on service required. No order has been placed yet.